If you’re thinking about buying an Oral B Kids electric toothbrush, this review will help you quickly know whether it’s right for you. In a hurry? Just skim through these 3 questions to decide. But if you’d like to learn all about the Oral-B Kid’s electric toothbrush , then read the rest of this detailed review. 1. Is there a problem with this kids electric toothbrush? Not at all. The Oral B Kids electric toothbrush is an attractive choice when it comes to brushing solutions for children. It does a good job of cleaning teeth and has several benefits that make it ideal for kids. However, in comparison to other kids electric toothbrush models, there are some things missing from this one. And if the Oral B electric toothbrush only includes these features, it will help make it fun for kids to brush longer and enjoy cleaner teeth. 2. What other kids electric toothbrush models are available? If the child is between 3 and 8 years old, the Sonicare for kids is an excellent alternative to the Oral B Kids electric toothbrush. It is a little more costly, but offers many additional features to justify the higher price. 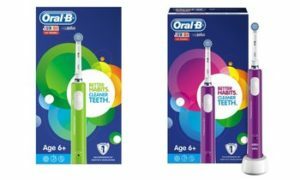 For an older child who won’t need much handholding and supervision, another great choice is the Oral B Pro 2500 which offers most of the benefits of a top-of-the-line electric toothbrush at a very affordable price point. 3. 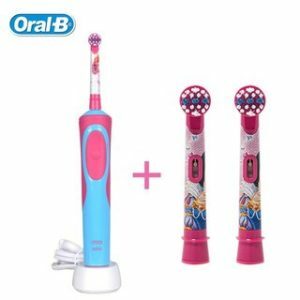 Where to buy an Oral B Kids electric toothbrush? You have many choices. You could buy the toothbrush from a high street store or pharmacy. Boots, Walmart, Target and other retail chain stores typically stock the model. 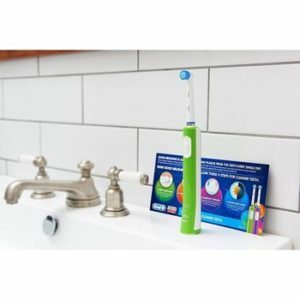 You could also order the Oral B Kids electric toothbrush online from Amazon and other e-commerce stores, often at special discounts or as part of limited-time deals. Why Should You Listen To ‘A Dentist’s Daughter’? Our service is independent of any big manufacturer or brand. We do not accept any compensation or reward for our reviews, which are therefore unbiased and fair. Also, our reviews are crafted from your perspective, as a buyer. We ask what you would like to know about an electric toothbrush – and then find the answers to your pressing questions. Over the last few years, we have reviewed several brands and models of electric toothbrushes. Each of our reviews is based on extensive research and analysis. Our electric toothbrush reviews are often deep dives into features, advantages and variables you should always consider before buying an electric toothbrush. Our only aim is to give you enough value and data that you can make empowered choices about your ideal oral hygiene and teeth cleaning solutions. We want to help you choose the electric toothbrush that’s perfect for your needs. If you haven’t seen it already, please check out our Buyers’ Guide for the Best Electric Toothbrush. It lists the most critical features that any buyer should consider before making a decision. Now before we get deeper into it, a word of explanation. The Oral-B Junior electric toothbrush is a hybrid of a full-featured adult toothbrush and a little kids’ version. It is designed with the older child in mind, who is aged between 3 and 14 years. The Oral B Kids electric toothbrush has a larger brush head, softer bristles and a slim handle that fits comfortably into little hands. It is designed for the more developed yet tender gums and teeth of children in this age group. There are two kinds of Oral B Kids electric toothbrush, with the difference being only in the color of the handle. In every other aspect, they are identical. 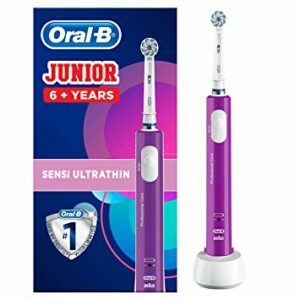 The Oral B Junior Kids electric toothbrush has a purple handle or vivid green. Not all retailers stock both colors, so if you buy it offline you might have to settle for whichever is available. A beautiful design with a slim and slender handle that is available in two attractive colors. An inbuilt timer with quad-pacer settings to ensure that a child will brush all teeth for the desired amount of time. A battery status indicator that shows when it is time for a recharge by lighting up an LED on the handle. There’s little to attract and appeal to young children, like other competing brands and models offer. Battery life is short and makes it harder to consider as a travel toothbrush – unless you’re planning to take along a charging station. The packaging and design of an Oral B Kids electric toothbrush reflects the audience. Bright, colorful and appealing to a child, the presentation is sophisticated and smart. As mentioned earlier, there are two colors – purple and green. Except for this variation in handle color, the other features are identical. Purple is slightly more popular among children. Both versions are fun, engaging and bright, more so than a neutral white that’s common with adult electric toothbrushes. The experience of using an Oral-B Kid’s electric toothbrush is also pleasant. The slim and slender handle makes it convenient for holding by even little children. The handle is of plastic, smooth and ridged with rubber grips to help hold it more securely with wet hands. In front, the handle has an oval/circular power button used to turn the toothbrush off and on. Beneath it, near the bottom, are the LEDs indicating battery charge level and other feedback. The Oral B logo in white contrasts against the colored background. The rubber grip runs along the length of the brush handle and has a series of ridges that make it easy for a child’s fingers to stay in place while brushing. Even when the handle becomes wet with water or foam running down the edge, this grip prevents accidentally dropping the brush or losing a firm hold on it. The battery and brush motor are sealed within the brush handle of an Oral B Kids electric toothbrush. The rechargeable Nickel metal hydride battery retains charge for 7 days. Recharging the device is easy. Just place it on the charging stand, which has a prong that fits into a recess in the brush’s base, and leave it overnight. The handle has a squarish cross-section, not round. The base is thicker than the rest of the brush handle. Near where the brush head attaches to it, a rubber notch extends out. This is to keep the brush from rolling off the counter when placed sideways on it. A metal shaft extends from the handle, to slot into the brush head and transmit the motion from the internal brush motor to the cleaning bristles. A single Sensitive Oral B brush head comes included in the package. Although this kid’s electric toothbrush is designed for children to use, the brush head is almost the same as an adult head and not really specialized for exclusive use for children teeth. A brush head with soft bristles is great for sensitive, developing gums and teeth as is common in growing kids. Like any other replaceable brush head, the ideal time to change to a new brush head is after 3 months of regular use (brushing twice every day for two minutes each). The brush head has ‘indicator bristles‘ which change color from blue to white when it is due for replacement. It’s quite easy for a child to operate this toothbrush. All you have to do is press the power button to turn on the motor, and start brushing. Because there is only a single operating mode, there are no complicated arrangements to make. To indicate that you have brushed for long enough, the inbuilt timer will indicate by a brief pause every 30 seconds that it is time to move to another quadrant. There are four quadrants in all – upper right and left, and lower right and left. The entire cycle lasts for 2 minutes, which is how long most dentists recommend brushing for the best results. The timer begins counting down right from the time you turn on the electric toothbrush. So if a child playfully takes a longer time to begin brushing, it will not clean adequately if you go by the timer alone. Make sure you encourage your child to enjoy brushing his or her teeth – and adjust the duration according to their needs. What might make this process even more fun is some interactivity with the user. Other kids electric toothbrush manufacturers have built in some such features, but they are lacking in the Oral-B Kid’s electric toothbrush . High end brushes even have bluetooth compatibility which syncs with a smart phone application to motivate kids to brush more thoroughly and regularly. While older children may not need all these gimmicks, experience shows that kids of any age tend to be reluctant to spend enough time cleaning their teeth. Anything that helps engagement and regularity is welcome. The Oral B Kids electric toothbrush does come with an informative card that explains the stages of brushing and highlights the advantages of doing it regularly. One helpful feature that the Oral B Kids electric toothbrush does include is a pressure sensor. Pressing too hard while brushing could injure gums and teeth. The Oral B Junior toothbrush will automatically turn off if it senses too much pressure. Until the pressure is relieved, the pulsatile movements will stop. The sound of the motor will change, though there is no visual indication of this alteration. The major benefit of an Oral-B Kid’s electric toothbrush is that regardless of how strictly a child follows the instructions or not, the end result will still be better oral hygiene and dental health than using a manual toothbrush. A kids electric toothbrush is better at removing food debris and bacteria, as well as avoiding build up of dental plaque, to keep your mouth healthy and teeth bright. The brush handle is waterproof and can be rinsed in water or used in the shower. However, take care not to immerse the toothbrush completely under water. The Oral-B Kid’s electric toothbrush feels solid and robust, with the sensation of a high quality product. The brush handles are very sturdy and durable, and are well structured to withstand the normal wear and tear of its younger users. Accidental falls and slightly rough use won’t totally destroy the toothbrush. The Oral B Kids electric toothbrush comes with a standard 2 year warranty. You can register online for an extended 3 year warranty at no added expense. This toothbrush is a good bridge until your child is old enough to use an adult electric toothbrush. Your decision to get the Oral B Kids electric toothbrush is probably going to depend on whether you’re convinced that it will be engaging and interesting enough to keep your child brushing regularly. Everyone wants an electric toothbrush with a reasonable battery life. Ideally, this would mean a brush works for two weeks on a single full recharge. Unfortunately, there aren’t many models that deliver this result. The Oral-B Kid’s Junior electric toothbrush has a battery that only lasts for a week. This means you’ve got to carry along a charging station while travelling. And there’s the added responsibility of making sure your child places the handle back on the charger after use. If you regularly follow a 2 minute cleaning session routine twice in a day, you’ll get 28 minutes of action or 14 brushings per full recharge. However, in practice, it’s usual to get a few more extra days than that. Still, if you’re a frequent traveller, count on packing the charger along. Fortunately, the Oral B Kids electric toothbrush handle comes with an LED indicator that tells you how much of battery charge is still left. This lets you plan and recharge ahead of time. While charging, the LED flashes green. A red blinking light indicates low charge, and you should immediately recharge the toothbrush. Even though it isn’t essential to keep the device always on the charging station, it’s convenient to teach a child to do it so that you don’t forget and run out of juice. Leaving the brush on charge while not in use is perfectly safe. The charging station is standard fare and can be used to charge any Oral-B toothbrush . You won’t have to use different chargers for every individual in your family with an electric toothbrush. It takes around 20 hours for the device to charge fully, which isn’t very efficient when you consider the running time of barely 28 minutes. Still, since you’re just going to leave it connected overnight, it doesn’t make too much of a difference in practice. The battery is a Nickel Metal Hydride battery instead of the more common Lithium ion cell which offers longer run time. Like any other model the price you’ll pay for your Oral-B Kid’s electric toothbrush will depend upon where you buy it and if you find any special deals or have discount coupons. If you shop online and aren’t in a rush, you’ll often be able to pick up this model for half of the regular retail price during flash sales and special offers. The toothbrush will last you between 3 and 5 years, so it is actually pretty good value for your money. Even assuming 12 changes of brush heads over the lifetime of your Oral B Kids electric toothbrush, the cost of ownership is a modest 4 to 5 cents per day. While price alone won’t be a deterrent, you might be swayed by other alternatives because they offer some more benefits and features. 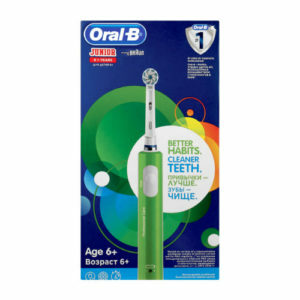 This will depend upon the child’s age and how engaging s/he finds the Oral B Kids electric toothbrush. Most popular Oral B models like the Oral-B 1000 electric toothbrush and the Oral B Genius Pro 8000 have been out of R&D for several years and the manufacturing process is evolved and streamlined. Almost all of them are reliably, long lasting, solid and durable. Although there is always the possibility of manufacturing defects and quality control, these are thankfully very rare. And the company warranty of 2 years is indication of their confidence in the rarity of defects. What’s more, you can extend the warranty by an extra year for free just by registering online. In combination, all these factors make the Oral-B Kid’s electric toothbrush a good choice for children who want to use an electric toothbrush. With a distinctive, eye-grabbing colorful handle, the Oral B Kids electric toothbrush is a great choice for children. A built in timer with quad-pacing, great performance at cleaning teeth and removing plaque, a manufacturer’s 2 year warranty, and good user reviews makes this a top choice for a kids electric toothbrush. Of course, things could be even better. A Sonicare for kids is far more engaging, and has added features which make the brushing experience more pleasant and fun. But for older children who don’t have much trouble cleaning their teeth, the Oral B Kids electric toothbrush could be a good option. With a single cleaning mode and good performance along with comfort and ease of use, this device checks most boxes on our list. By buying it online from Amazon or other retailers, you can enjoy the price discounts and coupons that are offered from time to time and save some money. Q: Is the Oral B Kids electric toothbrush an oscillating device? A: Yes, like other Oral B toothbrushes, this too has the patented 3D motion which includes oscillation, rotation and pulsation. Q: What is the cleaning mode? A: The Oral B Kids electric toothbrush offers a single cleaning mode called ‘Daily Clean‘ which when used with the Sensitive brush head can achieve excellent cleaning of a child’s teeth and improve oral hygiene. Q: What brush head is included? Which other heads can be used? A: The Oral-B Kid’s electric toothbrush comes with a Sensitive brush head in the package. While it is an adult sized head, it does have softer bristles which are friendly to a child’s immature gums and sensitive teeth. Like any other Oral B toothbrush, the Junior Kids brush is also compatible with other brush heads like the Cross Action, Floss Action, 3D White, Sensitive, Precision Clean and TriZone brush heads. A: Yes, this brush has a pressure sensor to help avoid accidental damage from pressing too hard. There is no visual indication, but the motor automatically stops when a child presses down too hard. Q: Does this model have Bluetooth? A: No, the Oral B Kids electric toothbrush doesn’t come with bluetooth compatibility. Q: Does the Junior Oral B have a timer? A: Yes. There is a built in timer to help ensure that a child brushes for the entire 2 minutes. There is also a quad-pacer which indicates every 30 seconds that it is time to shift to a different quadrant, thereby making sure the entire range of teeth is cleaned effectively. A: After a full recharge, the Nickel Metal Hydride battery lasts for 28 minutes of cleaning activity – which translates into 7 days of regular use. Q: Is a charging station included in the package? A: Yes, the Oral B Kids electric toothbrush comes along with a charging station. A: No, the Oral B Junior Kids electric toothbrush isn’t designed to be fixed to the wall. It can be placed on the charging station, flat on the counter. Q: Can it be used in the shower? A: Yes, because the brush handle is entirely waterproof. However the brush should not be fully immersed in water. Q: Is there a travel case? A: No, a travel case is not included. Hopefully you found this information about the Oral-B Kid’s electric toothbrush useful in making your decision. If you have any further questions, or would like to share your feedback about this toothbrush, please leave a comment.